A beachfront, direct ocean view home for the most particular buyer. This 2 bedroom 2 and a half bath apartment has been carefully and exquisitely renovated from top to bottom with solid wood cabinets and top quality carrera Quartz countertop in kitchen. Subzero & Miele appliances. Italian Marble Bathrooms. Full size new washer dryer in your own laundry room. Honeywell AC, Lutron LED Lights. Security cameras throughout. Stunning light fixtures. 2 terraces. Open breathtaking views. HDMI & CAT 5 wiring has been done and hidden in walls. Come and enjoy ocean breezes and direct open ocean views as far as the eye can see. Could be a great investment too! Currently rented at 5k per month. 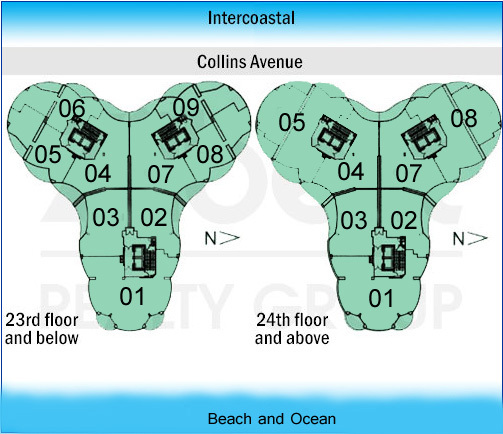 Ocean Four is resort style living with 5 Star staff and amenities. Restaurant by beach, low maintenance.